Dining etiquette isn’t so much a specific set of rules as it is a bundle of civility skills pertaining to sharing a meal with others. Socially or in business, it is appreciated and necessary. Situations and circumstances vary whenever people gather to dine. 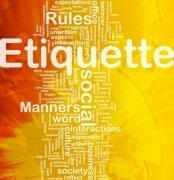 Etiquette and manners are directional rather than directive. As you learn to be present in the social situation of dining, you embrace a willingness to learn patterns of orderliness, and to be alert to what a situation calls for. But if you wave your fork excitedly during conversation, or if your glass ends up with lipstick all around the rim, someone will notice. Knowing what to do when dining, whether at a restaurant, at a formal gala event, or in another country or culture, is a worthwhile aim. It’s accumulated knowledge, but at the core is a desire to learn recognized practices that encourage respect and help others feel comfortable and welcome. An appreciation of dining etiquette is also a ticket to your increased confidence and comfort and fosters the ability to relax and enjoy yourself. You know the boundaries of your personal space at the table - what tools are yours to use and what tools belong to your table companions. It’s a system of understanding that no one speaks of while actually engaged in. It would be bad manners to correct a fellow diner. Dining etiquette is about following signals, particularly those of your host, rather than judging those who aren't aware of the guidelines. Don’t drink, eat, or place a napkin on your lap until your host does. Used utensils do not belong on the table. Follow the "resting" and "I'm finished" utensil positions. Don’t reach over a fellow diner to greet someone with a handshake. An acknowledgment of eye contact and a nod of your head in greeting is enough. If you have to leave the table, do so between courses. Not when food is on table. If you know you will receive a “silent text” during a meal due to an emergency, let the host and/or table know. Wait for everyone to be served (each course) before eating. If bread needs cutting on a board, use a napkin to steady it rather than your bare hand. Pass bread to right. Do not place food on the table. Always keep it on a plate. Butter your bread over the bread plate. No need to move it closer. Use acronyms to remember the order of your space at the table from left to right: BMW (Bread, Meal, Water), or put your thumb and index finger together with your other three fingers raised to make a "b" with your left hand and a "d" with your right hand - bread on the left, drinks on the right. Don't overload your fork, and therefore, your mouth. Small bites are best. Place your handbag in a space designated by your host, in your lap, or behind you on your seat. Never on the table. Good posture = fewer mishaps at the table. Always be kind to servers. Your bread plate is also a trash plate. Place straw wrappers, plastic coffee cream containers, etc. on the bread plate so it can be picked up easily. Remove any undesirable food from your mouth the same way you put it in - with your fork or spoon. Use your fingers only for finger foods. Otherwise, a utensil is best. Don’t take food from someone’s plate. Make sure you speak to the person to your right and left. Pace yourself while eating so that the table is somewhat in unison, particularly when going course-for-course. If you are at a restaurant, go course for course. Cut sandwiches and burgers before eating with your hands. This helps make them less messy. Don’t eat asparagus with your fingers unless the other foods on your plate are also finger foods. Avoid conversations about the diet you’re on. 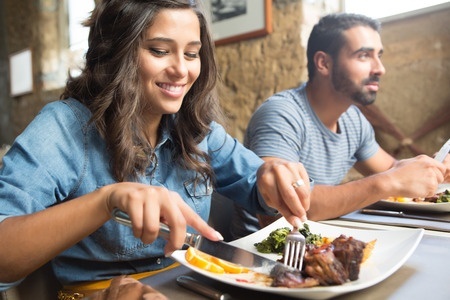 If a food that you don't like is served, avoid eating it or move it around on your plate so it looks like you had a bite of it. Avoid scratching, playing with your hair, blowing your nose, rubbing your eyes, etc. at the table. If you're knew to dining rules, don't let this list overwhelm you. Learn and practice a few guidelines at a time, adding more when you feel comfortable. Before you know it, you'll approach every table with confidence. After all, sharing a meal with your friends, family, or business colleagues, shouldn't be stressful. It should always be a pleasure.